I recently attended the Shawnigan Lake SLAM Street Festival, wanting to perhaps meet a few people and connect with my new community. This festival was, after all, about bringing the community together. I thought I would just jump in and get involved so I offered to help. While setting up, a chalk drawing broke out on the street in front of me. 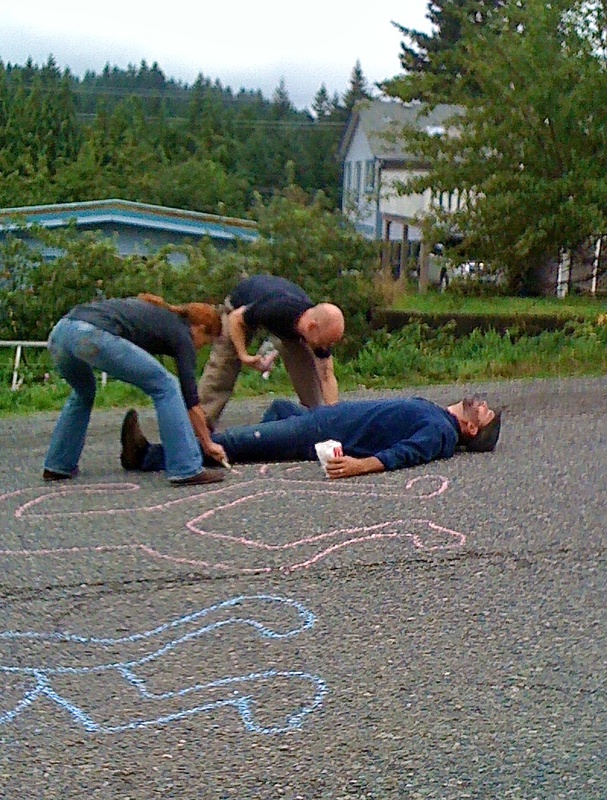 I had to laugh – my instant thought was, you know you are in the right place when…there are grown adults laying in the middle of the street playing with chalk. Not exactly the sentiment for all adults maybe, but for me it’s a perfect fit. I was delighted even before the event got started. We’ve most definitely picked the right place to call our home. I’m curious – how would you finish that statement: “You know you are in the right place when…”? You know you're in the right place when that warm smile flashed at you feels like a hug. We just moved a few months ago to a new small town and we love it. We are having a Fall street market every Thursday until Nov 4th. SO many smiles that make ya feel those hugs!! Thanks for sharing your thoughts, Regi! What is it about these small places that make people more willing to smile and say hi. Certainly does give the place it's charm.